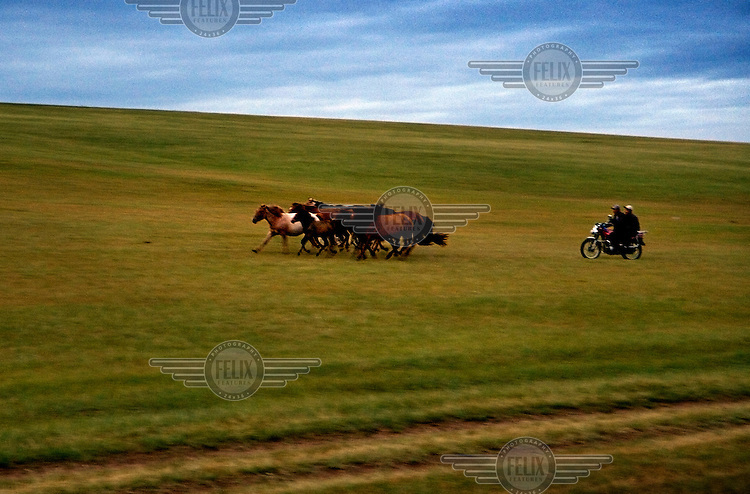 Horsemen herd their horses using a motorcycle on the grassland.."The Horse Boy", embarked on a therapeutic journey of discovery with his parents to visit a succession of shaman healers in one of the most remote regions in the world. Following Rowan's positive response to a neighbour's horse, Betsy, and some reaction to treatment by healers, Rowan's parents hoped that the Mongolian shamanistic rituals along the route and the prolonged contact with horses would help to unlock their son's autism and assist his development.. Restrictions: Not available in Austria, France, Finland, Germany, Italy, the Netherlands, Poland, Spain or Switzerland..